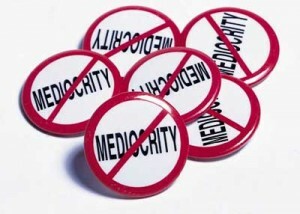 Ah mediocrity… the desire to be average, just like everyone else. We feel so down on ourselves but not greedy enough to want to be better than anyone else… just to be in that nice safe middle ground where we consider ourselves an average person. Is there really such a place? If there is, does that “average person” place change when the majority of people have economic struggles and unprecedented levels of unhappiness and even depression? Is that place really what we’re supposed to be shooting for? To be average? Ever stand around with a group of people talking about “kids these days” and how it doesn’t matter which government party you vote for, “they’re all the same”… did a single one of us ever think it was ok that billionaires got even richer while everyone else foreclosed on their house? Is that normal? Is that how society is supposed to be? Do I really want for my children to grow up to be “normal” or to strive for mediocrity in the midst of all of that? The sad fact is that for many parents of children that have Autism, that’s exactly what we wish for. For our children to have an equal chance, to have a normal social life… to have a chance at happiness with friends and even a family of their own. Autism sometimes leaves a child unable to speak, use a toilet and so forth… they can be quite aggressive, prone to outbursts and certainly unable to maintain a friendship. It’s easy to understand how a parent would wish for them to simply have what others have… a chance to be average. Put it this way… if you aim for a 10… and get 9, you were close. But if you shoot for 50 and get 35…. well, you’re not really even close but aren’t you glad you didn’t shoot for 10? I know, that’s incredibly simplistic but most anyone who’s put those methods into practice will tell you that this kind of mindset does work. It does force you to push harder than you have before. In the case of Autism, you may get your child into therapy once a week, you may try to get him a teacher’s aid if funding is available…. where as, if you decide to shoot for so much more than an average life.. you will get on that phone, show up in government buildings weekly and have letters written daily in the mail pushing for a special education, separate therapists handling separate areas of development bi or even tri-weekly. You don’t have to spend a fortune either… just have that desire, that hunger… that need to push for so much more than mediocrity. When the average person begins learning business… they find that they need separate courses in management, finances, economics, human resource management and the list goes on and on. The question is, do they start on this path with the intention of having a business that earns them minimum wage like their friends make… or to have a successful business and live a comfortable.. maybe even high class lifestyle? The point is, nothing worth having is easy. It takes a life time to get the life’s worth of experiences to get yourself into a position to have a better life than the average person. These days, even winning the lottery won’t get that for you… most lottery winners claim bankruptcy within five years of getting their winnings. Why? Because they don’t have the life skills/experience to know how to manage that new lifestyle. I hear ya, I have never cared for being rich myself but I sure would like to have enough money to be able to buy things I need without having to worry about whether or not I’ll still have enough for rent. Truth be told, I’d love for Cameron to have an equal chance just like everyone else as well but that’s not my goal. I know there’s greatness within him… and I don’t know when or how it’ll show itself… I honestly don’t even know if it ever will, but it’s that greatness that I’m in search of. If I never give up on that, if I always work towards that…. then one day he’ll far surpass mediocrity and I’ll have either reached the goals I had set out for him or I won’t but I’ll be proud of how far he was able to go. I up rooted my family and moved to where I knew there would be teachers and a school system that would support him. I gave up my house and my job and friends and even my family to get him here… not because I want him to be average. You don’t need to shoot for riches or to be the next great thinker for the history books… but don’t shoot for being average either. Everyone is capable of so much more. Even if it may not seem like it right now, the potential is there. It’s up to you to never give up on it and it’s not going to be easy. But don’t feel guilty for shooting for the stars. The Autism will always be there, in our children…. but so will their potential… so will their greatness. Good post! I agree that I never want my children to be average – average is a term that doesn’t work when dealing with one of anything. In this case, the ‘one’ is each of the boys. I want them to be who they are. And that in itself is what makes them great. Potential is limitless. Striving to reach our potential is what makes us human. Lovely post, as usual. I keep aiming for more than average with my daughter with Autism. I am constantly told that most people with Autism do not have a job. She has had a job before. It was not full time, but she loved it. I keep after everyone involved in her circle of support because she needs and eventually will have another job. What the average person with Autism has is just not enough. Particularly when her happiness is at stake!